Compared to our neighboring cities, Tuesday’s Tustin City Council meeting was downright festive. Even the council members were dressed casual Friday. Irvine, as you know, is attempting to hoodwink their residents into thinking that plans for the veterans cemetery died with the NO vote on Measure B. Of course, nothing could be further from the truth and now the factions that covet the ARDA location for 5 Points are scrambling to find a different, albeit suitable, location at the Great Park. Meanwhile, the City Council of Santa Ana voted to place a sales tax measure on the November ballot. The measure would add an additional 1.5 percent to the current 7.75 percent tax making Santa Ana the most expensive city to shop in Orange County. They will still be lower than Long Beach, Santa Monica and most of the South Bay cities who come in at a whopping 10.25 percent. I knew that our city council meeting would probably have higher than normal participation this evening. Even I was surprised to see a nearly full house, however. I knew some of us were here to support the proposed reinstatement of the Historic Resources Committee. A look around the room showed a number of signs opposing the Sanctuary State and there were a good number of folks wearing red shirts which I’m sure meant they stood in solidarity for something, I’m just not sure what. The meeting started late due, I’m sure, to a lengthy Closed Session. There were 7 items, including labor negotiations discussions with all of the unions and associations representing municipal and sworn employees. Other than the denial of one claim, our intrepid city lawyer, David Kendig, reported no other action taken. We’ll never know for sure since closed sessions are….closed. After the opening ceremonies, Mayor Al Murray opened the Public Comment section of the meeting. There were several speakers who voiced their opposition to SB54, the sanctuary state law saying it had nothing to do with keeping children of illegal immigrants with parents and everything to do with keeping our children safe. The council sidestepped the argument, at least temporarily, by pushing the subject to the September 4th meeting. I think we can expect a full house on that evening. I’m sure the city council would like everyone to forget but it’s our duty to remind them. Most of the Consent Calendar was passed unanimously. A couple of items were pulled for discussion. One of those items was the HVAC cooling tower replacement for the shuttered library. Apparently there was a last minute change in vendors. The good news announced by Mayor pro tem Beckie Gomez is the long awaited reopening of the library building itself. Saying they would begin moving the books from the temporary library back to the shelves of the main building, Gomez expects the doors to reopen by August 22nd. Somewhere in the course of the evening, the subject of the Voluntary Workforce Housing Incentive Ordinance came up for discussion. And this, I discovered, was the real reason for the crowd. Residents complained the ordinance was being slipped through without proper notice. Some were concerned the ordinance was an opening for homeless housing, a highly contentious issue we haven’t visited since last year. Others, it was obvious, were just plain confused on what the ordinance was about. They were just certain it had to be a bad thing. So, the city council did the only logical thing possible. They pushed the issue off to the next meeting in September. Again, I’m sure Al, the Doctor and the ladies hope the delay will work in their favor. We’ll have more on the proposed ordinance in a separate (hopefully informative) article. Backpedaling to the public hearings, Mayor Murray opened the floor to public comment on a proposed code amendment to the local alcohol beverage laws. No comments after a first reading means the proposal should pass in September. For those who couldn’t attend, it merely changes the square footage requirements and some of the separation requirements for alcohol sales. The new law will require a Conditional Use Permit for all alcohol beverage sales. That means the city will have a lot more say in where and when alcohol can be sold, including possibly extending hours. The second public hearing wasn’t quite so simple. The Planning Commission had previously denied a variance to a resident who wished to store their RV in the driveway of their property. Several speakers came forward and complained of code violations they had recently received regarding their RVs. Many complained they had stored their RVs in the same place on their property for years without a problem. In hearing comments from the dais, it was apparent that no one, including the city staff, was sure of exactly what the code intention was. Doc Bernstein sounded as confused as ever, making comments that….well, didn’t make much sense. After hearing the public comments (plus a few shout outs from the audience) Councilwoman Clark said she was concerned about how the city is communicating with residents and enforcing code. When she stated her concern that there may be other residents inadvertently violating the code, an anonymous voice from the audience said, “Yeah, about a thousand!” So, she further wondered if the code still met the needs of the residents. Watch it, Leticia, someone may think you’re a sane voice on the panel. Mayor Murray agreed with Clark and asked the city to hold the appellant’s application in abeyance (OK, he didn’t really use those big words) and take another look at the application of the code. He didn’t give a timeline but it is likely to be late September before we see this on the docket. There was a lengthy discussion on, what I felt was, the most important item on the agenda, the reinstatement of the Historical Resources Committee. Although the item was ripe for discussion and Old Town resident, Linda Jennings waited her turn patiently to speak on the matter, it was pretty obvious that most of the council was either too tired or not informed enough on the issue to discuss it. It is, however, important enough for us to talk about it in a separate article. No, I didn’t stay to hear all the exciting places Doctor Allan and the Mayor went to this month in their personal reports. And, although the Mayor mentioned that Councilman Puckett was absent due to being “under the weather”, he left us wishing the best for him. He has a month and a half to get better as the city council is conveniently dark for the month of August. At first, we thought there may be no Planning Commission meeting on Tuesday. A quick second look shows there to be a one-item agenda that may or may not go quickly. That’s because it brings up the resolution denying the design permit for a number of U-verse boxes AT&T has been trying to install in our town for, at some estimates, 15 years. 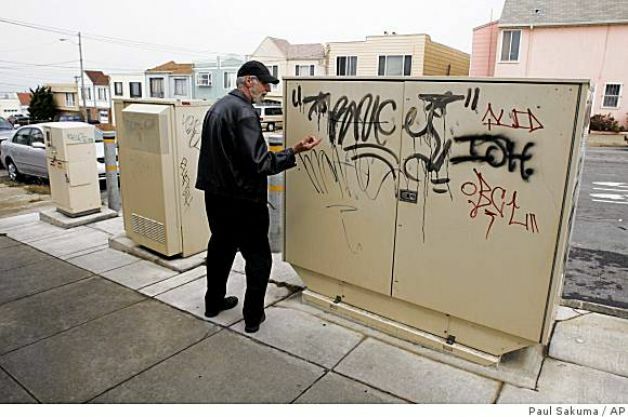 More than 10 years ago, AT&T applied for the installation of nearly 100 utility boxes in the city. The original application was turned down and the project languished in the halls of Ma Bell for several years until another, more serious attempt was made in 2005. Calling these “upgrades”, somewhere along the way the city discovered that much -if not all- of the installations were actually going to house new equipment that would include computers and fiber optic equipment for the U-verse technology AT&T invented to bring fiber optic quality internet and TV to the public. Back then, the boxes would all be above ground and a bit bigger than the current SAI boxes that house the copper wire phone and internet equipment we all see around town. We don’t know if it was the aesthetics or the tacitcs that soured the Community Development Department. We do know that, when city staff discovered the switch, they were quick to deny the application as it had been presented. And, once again, the project lay (mostly) dormant. Fast forward to November, 2013. At the November 12th hearing, AT&T made an application to install 25 VRAD boxes around the city to further their U-verse environment in the city. For more than an hour and a half, Leslie Monty, an engineer who represents AT&T fielded questions and answered commission concerns. Well, sort of. If we may digress: If Ma Bell wants to sell the product, they need someone who is prepared and unafraid to speak in front of a crowd bigger than say, five people. Monty’s discussion was less than adequate and amounted to AT&T’s opposition to any changes to their original application. She did say that AT&T was opposed to painting the cabinets because, supposedly, the beige and green the cabinets are normally painted to aid in dispersing heat (so, why do the new VRAD boxes have AC built in) and that their technology did not allow for underground installation, another request from the city. She later came back and said that any underground installation would require an access area that would be significantly larger than the underground vault itself and, if I heard right, would require an upper structure anyway to house the AC. She couldn’t answer why other utilities seemed to have overcome that problem and maintained that underground units were incompatible with their current technology. Further questioning revealed the underlying issue: money, of course. The cost of placing utilities in underground vaults is, to no one’s surprise, more expensive than setting ugly boxes above ground in front of peoples homes. Now, the city did say that only 4 of the boxes had to be underground. It was just a preference for the other boxes. Those four boxes were eliminated from the revised project presented in January of this year. At that meeting, the commissioners were looking for ways to get this project approved as it would offer another choice to consumers. But, they were pretty unified that a project would not go through if it impacted the aesthetics of the community. communities. The city does have a goal to establish a public art program in the future and wanted an option to at least make the boxes more presentable than the beige and green globs we are used to seeing. Oh, no, that wouldn’t be possible. According to AT&T’s Monty, the technology has not reached far enough to allow proper cooling, even with an AC unit, unless the boxes are painted an ugly beige or green color. And, even if they could be, the boxes which are supposedly painted with anti-graffiti paint, would no longer be warrantied. We swear, we are not making this up. Of real concern to us at Our Town Tustin is the makeup of the 3-2 vote of denial. It seems that Commissioners Jeff Thompson and Ryder Smith decided the boxes would be OK. In fact Thompson, adding minor and inconsequential changes, made a motion to adopt the original design review. Stating that he believed AT&T when they said that underground technology for the equipment cabinets just wasn’t there, he readily moved the item. And, although Chair Steve Kozak seconded the motion, he later withdrew it, saying he only seconded it for purposes of discussion. The reason we bring this up is because there are two Planning Commission seats open for appointment by the city council. One of those is Thompson’s. And, although he has applied for reappointment, we wonder if he has not outlived his usefulness on this influential panel. Over the past couple of years we have noticed he has not had the best interests of the residents in every issue that has come before the planning commission. This is not the first time he has danced a soft shoe in trying to accommodate a business or utility. He continuously worked to compromise the untenable Wilcox debacle and other recent issues in Old Town, even though he is a resident there. Jeff’s best qualification for the seat is his civil engineering background. We would argue, however, that is what the Community Development Department is for. In our opinion, it is time for a change. What does the city of Tustin and the County of Orange have in common? With a record low number of applications the city, much like the Grand Jury, is having trouble filling their commissions with qualified cronies applicants. With a suggested extension for interviews, the council will not have to bother with adding to an already full agenda. The city council may be spending as much time on Closed Session items as they will with the Public Session. One item, Edison Relocation on Barranca Parkway, is listed separately on the Conference with Legal Counsel, indicating it is an important item. We’ll try to find out more and let you know. New claims by Tustin resident Abid Hussain, Jesse Magana, Wilhelmina Zuckerman and Karen Stewart will be considered (and probably rejected) by the city. There are also two ongoing cases to be discussed. One of these is People v. Douglas Trumble. Trumble was arrested in 2013 for sale/possession of narcotics. The case was recently dismissed in Orange County Superior Court. Wonder what they have to talk about? The final items on the Closed Session agenda have to do with property purchases and swaps, all on the MCAS property. The city recently concluded a deal that would move the US Army Reserve Center over by the OC Sheriff’s Academy and other like institutions. Ever since the city has taken over as Master Developer, things have been moving nicely on the old base. Two Public Hearings head up the open session agenda. The first is a handshake on the development of 375 detached homes on the east side of the MCAS property. The hearing will include information on the taxes and facility fees to be paid. Standard Pacific Homes is the developer. The second item, which could garner some public comment is for the Community Development Block Grant funds. Staff is asking to reallocate funds from administration to development of projects such as the Bocce Ball courts recently approved by the planning commission. Funds will also be reallocated to “way finding signage” for Old Town Tustin. Some of the money will also go to developing a master plan for Old Town Tustin to encourage economic development. Although I appreciate that the city has made it easier (in some ways) to start a business inside of Old Town, we are always wary when the Community Development Department takes an interest in any way. The results are mixed and often to the detriment of the Old Town neighborhood. Item 7 on the Consent Calendar – Police Department Vehicle Purchase, should be pulled for discussion. Supposedly, the vehicles are being replaced due to high mileage and/or safety issues. The mileage on these vehicles is far from extreme, with the highest mileage vehicle being a 2006 Dodge Durango at 69k. With staff requests to pull reserve funds (see later) to pay bills, it doesn’t make much sense to replace vehicles simply because they are a few years older, particularly since these are “undercover” vehicles. No safety issues have been articulated so we figure is it just our cops wanting to be in style? Normally, we would grouse about the fact the city did not shop locally. Unfortunately, it looks like our local dealers weren’t interested in bidding. Under Regular Business, the Comprehensive Annual Financial Report for Fiscal Year 2013 will be available. Our accounting firm should be on hand to answer any questions concerning the report. I wonder if they would also comment on why city staffers are now revising the budget on the mid-year review and asking to draw heavily from reserves? Item 14 Fiscal Year 2013-14 Mid-Year Budget Review has staff asking for an additional $4 million dollars from various reserve funds ($2 million from water funds alone). While some of the expenditures, such as unexpected costs for water purchases could not be foreseen, others could. These include the relocation of sewer lines on Tustin Ranch Road and appropriation of equipment that should have been placed in the original budget proposal. Drawing from funds during a recovery phase is not the way to appropriately manage city finances. It’s a wonder the city is crowing about saving money while digging into reserves. The staff report justifying the added draws can be found here. The final item on the agenda is to authorize the advertisement for a consultant to develop a Commercial Core Plan for Old Town Tustin. We are glad to see this on the agenda as the city has, for too long, neglected the commercial revitalization of Old Town. Perhaps this will also get Elizabeth Binsack to also bring the second unit issue back to her desk for further consideration this year. That’s it for this weeks meeting. I recently upgraded my U-verse from DSL so my speed increased from slow-as-mollases to just plain slow. Now you know why I want AT&T to get approval for those darn boxes. In any case, I should be back to being able to view the meeting videos in a timely manner so that I can report back to my readers. Now, if I can just get my computer to cooperate. I hope everyone is having a great Martin Luther King Day. We are finally cooling off as the rest of the country embraces another round of freezing weather. It is days like this that remind me why I live in our town Tustin. It seems the city and the US Army have finally come to an agreement on a property exchange. For more than a year, the city has been pestering the Feds to exchange their current real estate, next to the District Shopping Center, for another parcel located near Warner and Redhill. The idea, of course, is to allow the District to expand while keeping the Army Reserve Center within the confines of the city. Actually, I think the city council could care less about the Army but they do want to serve their masters at the District. Sales tax, after all, is the bread and butter of a city. This works out for all parties as the Army was in the process of planning new facilities at the current reserve center. According to the staff report, those efforts will now be directed toward the new location. The Army has agreed to submit their plans for comment and to obtain grading permits. This should be interesting over the next few years to see what happens if the plans don’t conform to Elizabeth’s vision. The city has a habit of holding up the permit process when they don’t like what they see. The Army, on the other hand, has a habit of not caring about permits, etc. Oh yeah, and the “no-cost” agreement includes $170,000 payment to the feds by the city for they cost of the transfer. They also have to make sure water and sewage are in place. The rest of the agenda has the usual suspects. Along with the final discussion on the Army property swap, there are two other issues, including on between the city and the school district. Staff are asking the one Public Hearing Item on a development agreement for a 375 home housing tract on the MCAS property be continued to next month due to legal issues. Expect this to be worked out and back on the agenda. There is little on the Consent Calendar of real interest. However, it should be noted the staff are planning a bocce ball court at Peppertree Park. A great addition that I’m sure our senior will appreciate. But, why only two courts? Oh, and staff may want to revisit the proposed resolution as, according to that, the original intention was to establish a water play area. Item 13 on the consent calendar is for a grant application for federal funding for parks related programs. The $260,000 grant can be used for virtually anything park related. Staff have already targeted Frontier Park for the bulk of the proceeds. This is one item that could probably use some discussion either now or when the grant is approved. That’s it for this week’s Tustin City Council meeting. The year is starting off by cleaning up old issues. With an election year up for grabs and two city council seats up for grabs, lets hope it stays that way so our intrepid heroes can concentrate on the important stuff.